This classic french vanilla homemade soap recipe combines creamy vanilla fragrance with hints of sugar and musk. Plus the addition of lanolin to this homemade cold process soap recipe makes this handmade soap not only feel extra luxurious in the bath, but it also makes it a great shaving soap by giving your razor that extra slip for a smooth shave. You can “dress up” this vanilla homemade soap recipe with a touch of peppermint and a cream colored layer in the middle by setting aside about a fourth to one third of the soap after you’ve mixed the lye-water into the oils and it’s reached a light trace but BEFORE you add the fragrance oil. After setting aside a portion of unscented soap, add the french vanilla fragrance oil to the soap in the pot and mix with your stick blender until you reach a medium trace. Pour half of this soap into your prepared mold. Now add peppermint essential oil or fragrance oil to the soap you’ve set aside. If you reserved 1/3 of the soap add .35 oz. of peppermint essential oil or .9 oz. of peppermint fragrance oil. If you reserved 1/4 of the soap use .26 oz. of peppermint essential oil or .66 oz. of peppermint fragrance oil. Mix well with your stick blender to full trace then pour on top of the first layer of french vanilla soap you poured. Now pour the remaining french vanilla soap into your soap mold on top of the previous two layers. 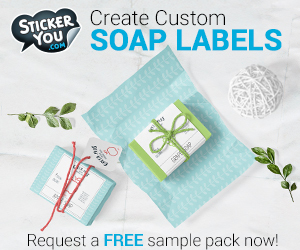 Dust with pearl, silver, or white sparkle mica powder if desired then cover and set aside for 24 hours before unmolding and cutting your soaps. 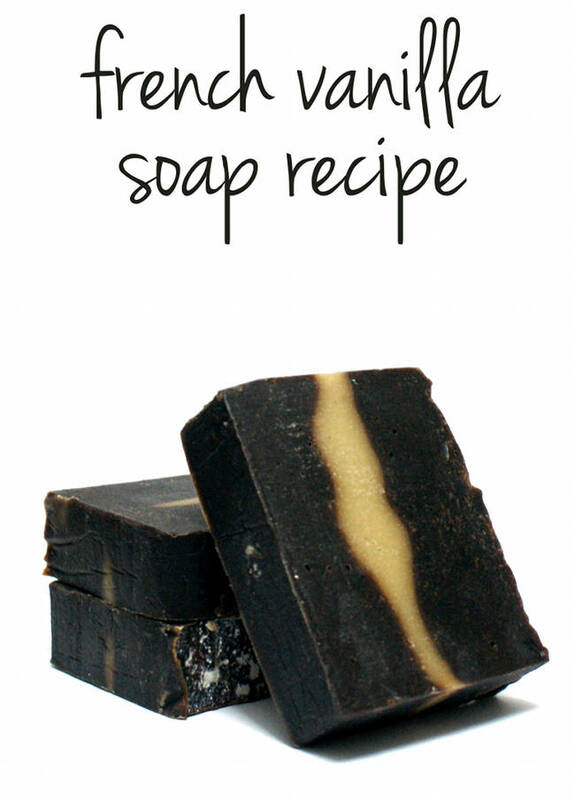 To get this french vanilla homemade soap recipe check out the Wholesale Supplies Plus. October 2014 issue of Handmade Magazine here. You can find my homemade soap recipe on page 9. Looking for more homemade cold process soap recipes? could you please tell how you pour the layers to get such a nice effect; you know not to “straight” but rather wavy? You just pour it unevenly while your soap is at a medium to thick trace and adjust with a spatula to desired effect.